Spring Snowflake – Delicate White Flowers! 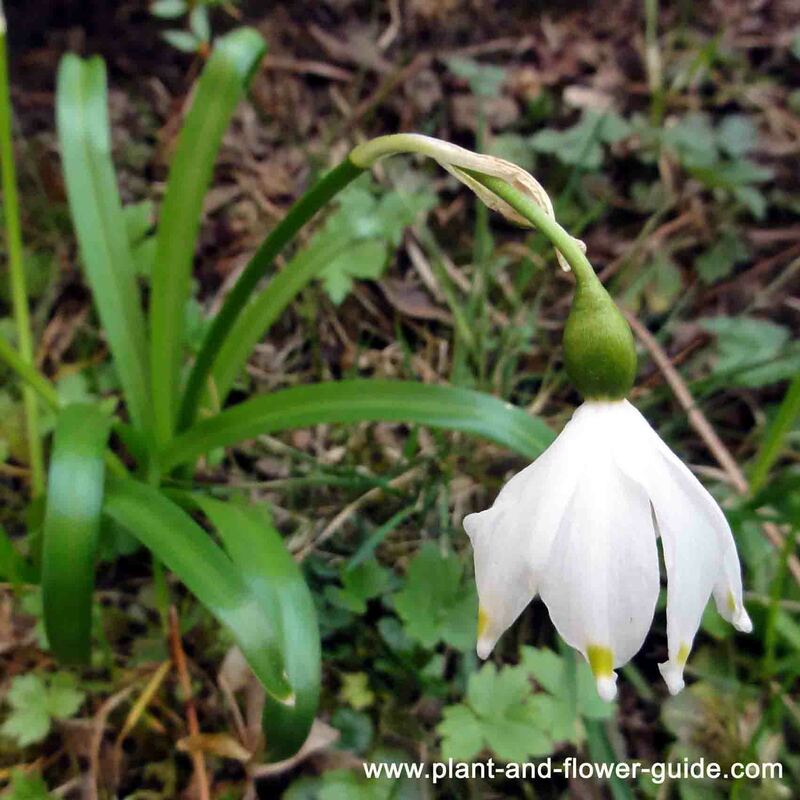 The spring snowflake flower is an early spring flower. It is native to central and southern Europe and spreads from Spain to western Russia. 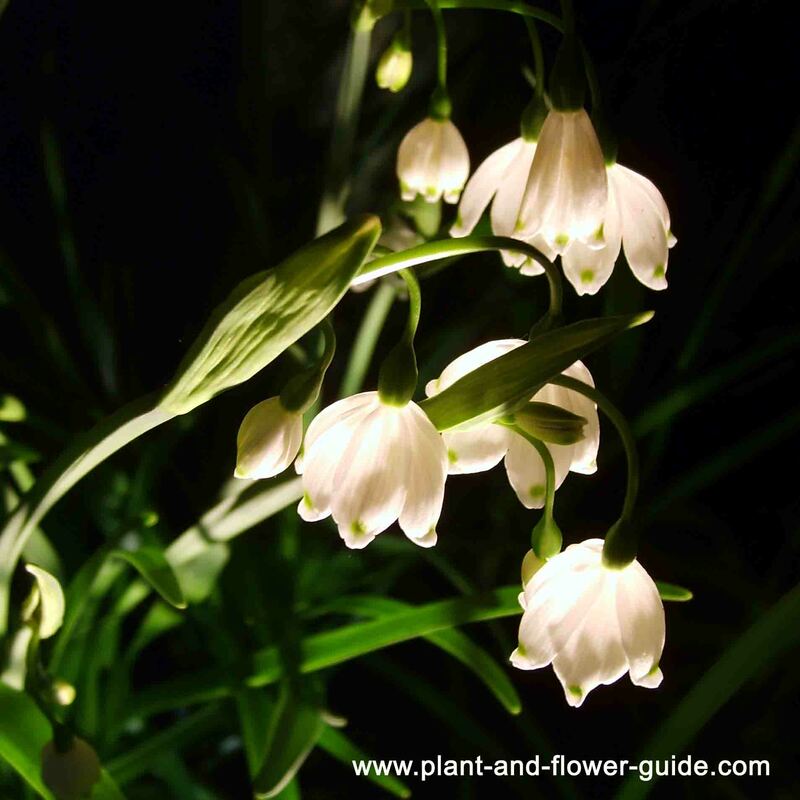 The summer snowflake (Leucojum aestivum) is a very similar flower that blooms in late spring flower/early summer and the autumn snowflake (Leucojum autumnale/Acis autumnalis) blooms in late summer/early fall. They have a pretty bell-shaped, white flower with yellow or green spots (depends on the variety) on the end of each of the six tepals. The diameter of the flower is about 1 cm and it presents itself in a nodding position. Usually there is one flower per plant and on rare occasions there are two. A very thin pedicel that grows from 10 to 30 cm in length holds the flower.They do have two to five narrow, spade-like quite dark green leaves that grow about 20 cm in length. Most people know these pretty little spring plants as garden and park plants but in some places they grow widely in the wild: These plants are protected and listed on the German and the Swiss Red List (possibly on other Red Lists as well, I did not check).The wild plants prefer to grow in forests where the soil is humid, nutrient-rich, moderate acid and rich in clay. The spring snowflakes usually grow in small groups but rarely they expand into very large groups. There are famous and protected places in woods in Germany that provide excellent natural environmental conditions for snowflakes to grow into very large groups: in the Leipzig Riverside Forrest (Leipziger Auenwald), in the “Märzenbecherwiese im Polenztal” (in Saxon Switzerland), in the vicinity of Haina (Thuringia), in the Franconian Jura (Bavaria) and in the forest of Hameln (Lower Saxony). This is a poisonous plant! It contains the highly toxic alkaloids lycorine and galantamine.When small amounts are ingested it causes nausea, vomiting and diarrhoea and when large quantities are swallowed and it causes cramps, paralysis, circulatory collapse and can even lead to death. Actually, various other amaryllidaceae plants contain these toxic components. Beware of them!